The Old Town Hall lies in the middle of the Regnitz river in central Bamberg. Initially built in 1387, it was rebuilt between 1461 and 1467 in Gothic style. In the 18th century it was remodeled to the baroque rococo architecural style. One of the most significant historical buildings in Bamberg, it nowadays hosts a museum. 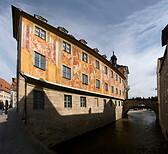 On its facade are impressive frescoes created in 1755 by Johann Anwander.